« What can your students learn from making a sign? This week, I’m getting ready for a number of upcoming STEM-related conferences and festivals. 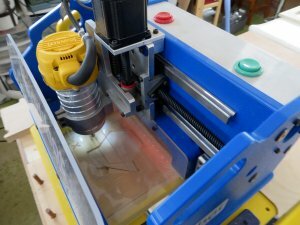 I’ll be taking both a Desktop and a Handibot, and want to have attendees get the thrill of running a ShopBot. 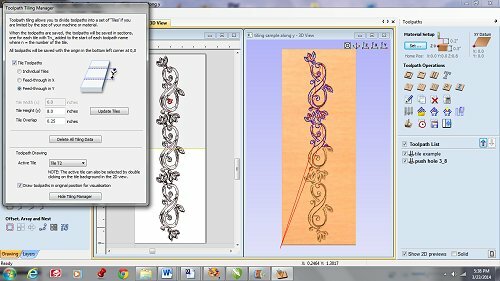 I use what I call the “3 min demo” that lets someone design a sign in CAD software, prepare it for machining in CAM software, and watch while the sign is V-Carved. There is a fair amount of prep: Design the blanks, create a jig and shims to hold the blanks firmly while they are being machined, cut out the masses of blanks, then sand and paint them. But the smile on the face of someone who has just completed their first ShopBot project is worth it. 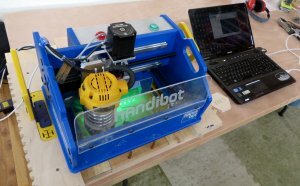 This year, I will be taking a Handibot in addition to a Desktop ShopBot. The Handibot is different than most CNCs in that you take the tool to the material rather than the material to the tool. As usual, I created a jig for the blank. But I need to be sure that that jig holding the blank is always in the correct location, so I created a jig for the Handibot itself. 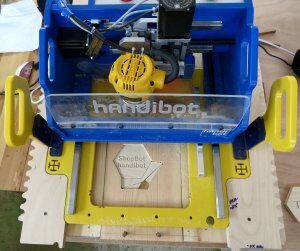 I didn’t want to repeatedly lift the Handibot out of the Handibot jig to give the finished sample to each person. Hmm, could I use the Handibot to move the jig for the blank out to a location when I could change out the blank without having to pick up the Handibot? A way to position the Handibot itself. 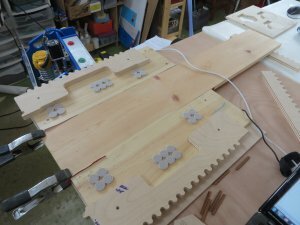 Solution: the Handibot Jig holds the sliding board side to side (X axis), pegs hold the blank jig from moving in the Y axis. Why the wavy lines on the outside? This jig has been repurposed from another Handibot jig, the wavy lines are not necessary for this purpose. The important features are the cut outs on the side that will position and hold the Handibot in place while it is machining. Why the felt pads? The weight of the Handibot can be used to hold the material in place. If the Handibot is sitting on the board that holds the jig for the blank, the board will not slide easily for changing out the blank. 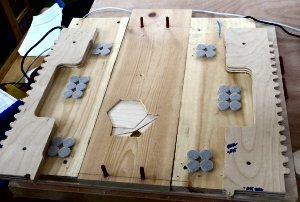 The felt pads hold the Handibot up enough that the board can slide under it. 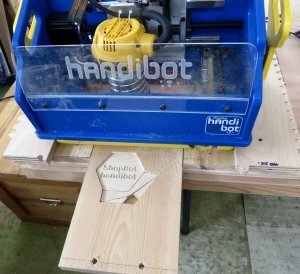 An added benefit is that sawdust doesn’t get trapped under the base of the Handibot so that the Handibot sits in the jig correctly. The sides of the Handibot jig hold the board for the blank jig in place in the X axis (side to side). Pegs at the front and back hold the Blank jig in place in the Y axis (front to back). 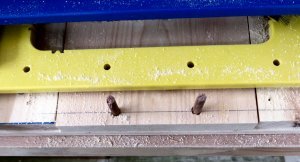 The holes for the pegs were drilled by hand when the blank jig was clamped in place…functional but not pretty. Notice that there is a small circle carved into the blank jig above where the blank goes. That is where the V bit settles to move the blank jig into position for changing the blank or carving. Handibot moving into position to carve the blank. 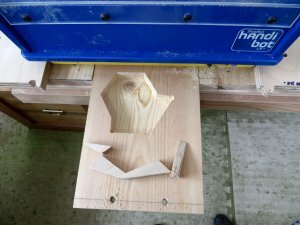 Blank carved and Handibot router in position to move blank out for changing (router is NOT turned on.) Command: M2, 3, 8. Front pegs have not been removed. After the bit is placed into the material (MZ-.05), the Command MY, 0 will push the board out from under the Handibot cutting area to expose the carved blank. Carved blank removed from jig and shims ready for a new blank. 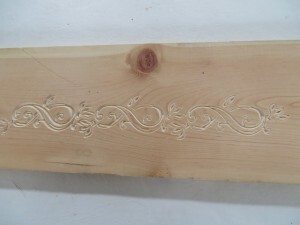 The Command MY, 8 will move the blank back into position for carving. Blank jig back in position under Handibot cutting area and pegs replaced. Note pencil line drawn to help line everything up. In the photo above, the Blank jig held in place with pegs has been replaced with a long board clamped at the front. Note the strips of sandpaper (rough side towards board) that add a little extra shimming power to make up for the allowance that allows the board to slide. The Handibot fits in the jig as before. 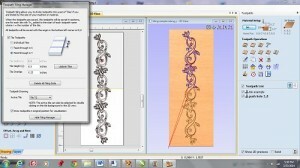 The file is designed in VCarve Pro/PartWorks. Note that the board is laid out with the width in X equal to the total amount of travel inthe X axis (6”). The Y is the length of the board (16” + inches) even though the travel in the Y is 8”. 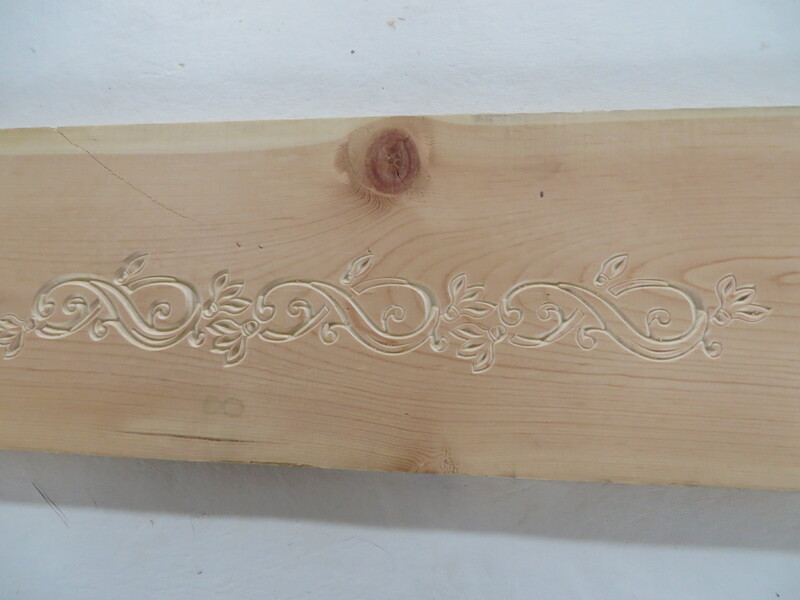 The cutting area of the Handibot is 6″ x 8″, while the finished carving is 6″ x 16″.